Prince D'Angkor Hotel & Spa is a sanctuary for tourist and corporate guests who expect excellent hospitality and friendly service. 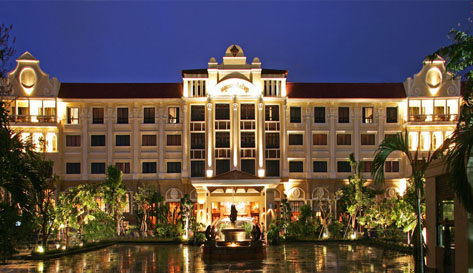 So whether you are on business or pleasure, the Prince D'Angkor Hotel & Spa is a luxurious haven, elegantly furnished to provide you with a comfortable stay and enjoys the facilities and traditional Cambodian hospitality of Prince D'Angkor Hotel & Spa. Experience ultimate luxury and bask in the splendor of elegance at the Prince D'Angkor Hotel & Spa, the perfect base to explore the legendary Angkor temples and undiscovered treasures in Cambodia. And our Concierge outlet to handle Airport pick up and transfer. If you have anything in mind that you want us to do, do not hesitate to contact us, we will find a way to assist you.
. All room rates are inclusive of daily breakfast and subject to 10% VAT and 10% service charge.
. All Rates are in US Dollar.
. FOC for children under 12 years of age sharing same bed (max. 2 children), plus US $ 3 per child.
. Extra Bed US $ 35.
. All mentioned rates are subject to change without prior notice.
. Check-out time 12:00, Check-in time 2:00 p.m.